Rebalance and purify your complexion with the Decléor Aroma Purete skincare collection, specifically created for those who need freshness. 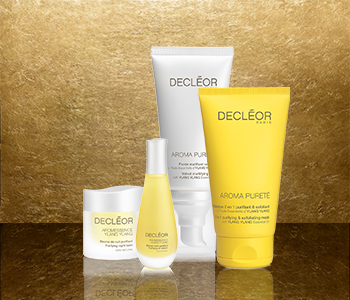 Perfect for oily to combination skin types, the Decléor Aroma Purete range harnesses the power of ylang ylang essential oil to reduce excess sebum, keeping skin mattified and balanced. From decongesting clay masks and mattifying fluids, to targeted treatments and super serums, the Aroma Purete product range will leave the complexion soft, clear and refined day-after-day.